When Daniel Flatauer arrived in Israel on his way to Japan more than 30 years ago, he had considered the possibility of staying. It was simply part of the travel adventure that he was enjoying. He had studied Education and Developmental Psychology at a university in England and taught for two years in an East Anglia primary school. But after a 2-year apprenticeship to a potter in East Anglia, he decided that Japan would be his next stop, and that he would stop in Israel on his way to see some family. Daniel never left Israel. His stopover visit turned into aliyah, immigration, and he soon married. 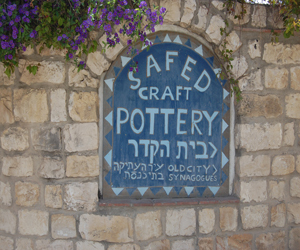 The young couple came to Tzfat, Helen, his wife, as a social worker, and Daniel with plans to open a ceramics workshop. Daniel found in the clay itself a teacher who has guided him as he has developed his craft, and his shop has become a favorite stop for many visitors who seek him out as they explore the art of Tzfat. As time has passed, Daniel has begun to explore the opportunities for creating stoneware and porcelain Judaica. Kiddush cups, (cups for ceremonial wine blessings), Seder plates (used for the Passover meal), candlesticks, ritual washing cups and menorahs (Chanukah candelabras - "the most challenging of forms" Daniel says) are available at Daniel's shop which borders the Old Jewish Quarter, next to the Artists Quarter, and directly around the corner from the General Exhibition of the Artists Quarter. "In Tsfat" says Daniel, "there's a fine balance between peace and quiet and time to produce work, and invariably interesting customers (local and from all over the world) for whom the pottery they buy is a reminder of their Tsfat experience." Daniel's work includes much introspection about Jewish/clay issues. "Why does God choose clay to make Adam?" he asks. "What does it mean to be 'clay in the hands of the potter'", a well-known biblical phrase. 'How exactly do you give birth on a potter's wheel? [mentioned at the beginning of Exodus]"
Daniel explains. "When you work with clay, every piece contains an aspect of you. Looking at my work, I see both England and Israel [and Japan],the influence of many other admired potters and teachers, friends, parents, students and customers. It seems to me that function, usefulness is the key- we learn something new, embody it in a shape, a glaze, a firing technique, and then pass it on- by selling it- to become part of someone else's story." Daniel continues to explore different directions that his work will take him. In the meantime, Daniel enjoys blogging about his work, and the forms, techniques, changes and inner rhythm of creating his special pottery in Tzfat.